You can’t take your eyes off Lou Barlow. Playing his heart out and bouncing around on every song he certainly doesn’t look like someone who recently had a new metal collarbone inserted. 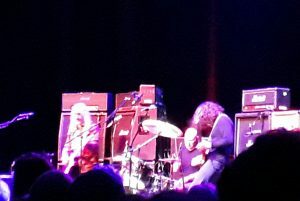 In stark contrast J.Mascis is stationary and relaxed, effortlessly delivering his signature solos to a packed Roundhouse. It is important to note however this is not in any way a phoned in performance. Watch any interview with J.Mascis and he is the epitome of chill. Completing the balance is Murph with his sharp, focused and yet playful drumming, and watching the original line up trio is a genuine joy. Dinosaur Jr. released their debut album in 1985. 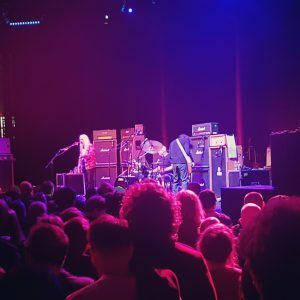 The fractures that followed in the band are well documented resulting in changes of members, with Mascis being the constant. This ultimately led to the band ceasing play in 1997, only to come back together as the founding line up again in 2005. The breaks in the band relationships, as well as ongoing personal creative drive, did however give birth to a wealth of solo records, side projects and main projects, such as the mighty and prolific Sebadoh. Despite this reviewer being personally aware of Dinosaur Jr. since the early 90s this was my first experience of seeing Dinosaur Jr. live. 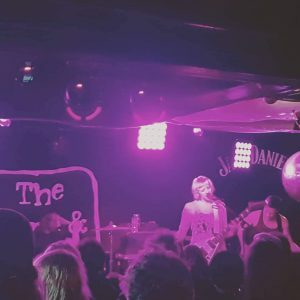 Advice given to me before seeing them was to “take earplugs” , a friend who has seen the band on many occasions describing one of their gigs as the loudest thing he had ever heard, detailing how the usual rock visual effect stack of amps were actually all turned on, and pretty much to full. This rescheduled gig from last December, due to Mascis being unwell, at the Roundhouse however was not unbearably loud, but perfectly pitched. So, to the music. 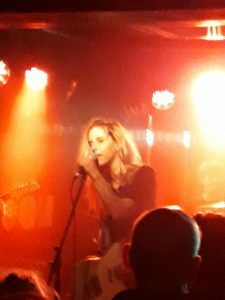 After initially opening with oldie Thumb the band launched into three tracks in a row from their latest album “Give a Glimpse of What Yer Not” (2016), though sadly “I Walk for Miles” is not played tonight. This is a bold move. It is a fairly diverse crowd in regards to age and gender, however it is clear that the majority are of an age to have been able to appreciate the older albums. 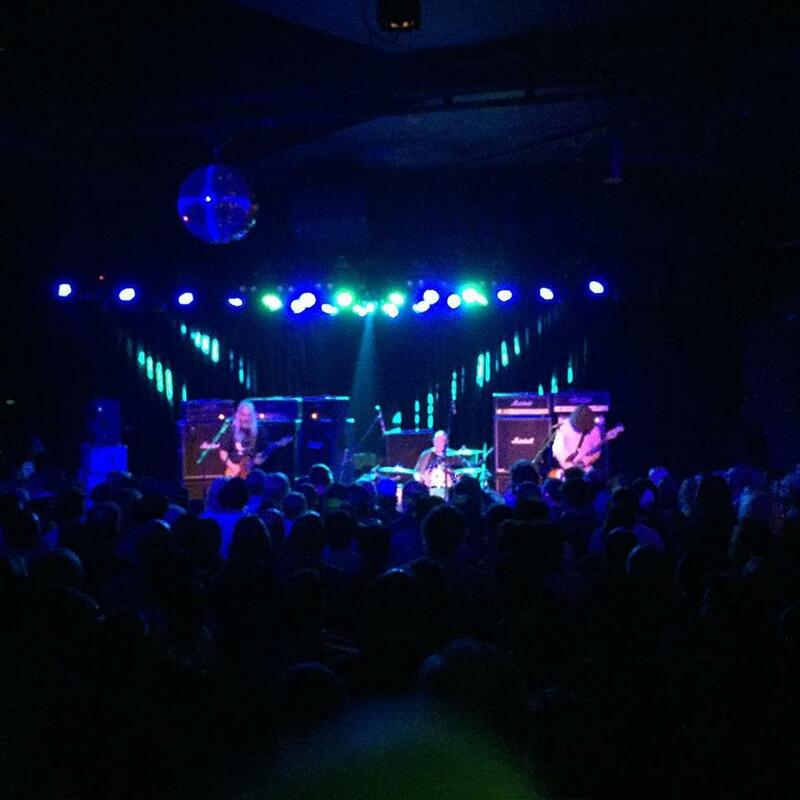 The new album is very strong however, taking all the best elements of classic Dinosaur Jr. and still sounding fresh. They do know their audience though, teasing the “Feel the Pain” intro but not playing the full song until a couple later when it is rapturously received. The tracks that follow completely span their entire career to date. 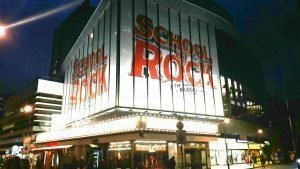 There is undeniably an air of nostalgia, but in the main genuine appreciation and delight from the audience who are hearing treasured songs from the past and present. It is a nice crowd, with the man next to me with his backpack on dancing his heart out on his own for the last 5 songs, including clear audience favourite “Freak Scene”. Everyone around him is smiling, enjoying seeing someone else take so much pleasure from the music. Talking from the band is minimal but thankful, with Murph giving away his drumsticks at the end. It was a great night.